This is one of those projects that never aired. The idea was that a bunch of guys are sitting around the backyard, and one of them tries to impress his friends with his new toy. "Fetch me a beer", he tells his new RoboDog. 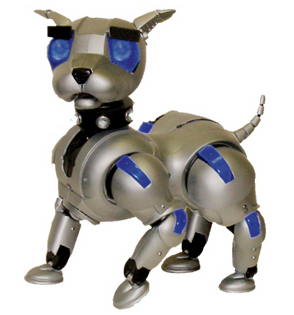 The Robot Dog marches into the kitchen, opens the fridge, and his neck telescopes up to grab a Brewski. 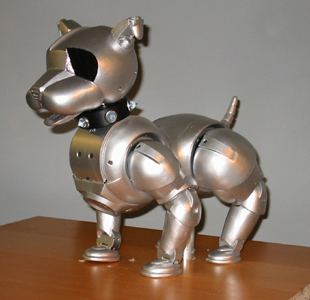 Robo Pup prances proudly by his now obsolete counterpart, a jealous and machiavellian real dog. However, the old dog has a new trick, and overturns his waterbowl, shorting out the Robot, causing it to spark and explode. Guess who currys the Master's favor by bringing out the requested beer bottle? As you can see from the design work, photos and test videos, we built a pretty sophisticated and versatile Robot Dog (two, in fact: one a walker and one a stander/neck extender). We built it all, working like demons through the weekend to finish, and arrived on set and shot it. However, it never aired, because of a fundamental problem: Budweiser decided not to show a commercial for Beer (a substance only legally consumable by adults) that revolves around a toy (an object more associated with children); no matter how cool the toy is. Click to see the progress video!